Some of the required kits may be hard to source or need conversions to model the subjects accurately. This is only a minor drawback. The collapse of the Soviet Union saw the sudden creation of a swath of Air Forces with legacy Soviet equipment. As time passes these are being upgraded or overhauled offering the modeler a choice of colours and markings well off the beaten track for Russian aircraft designs. 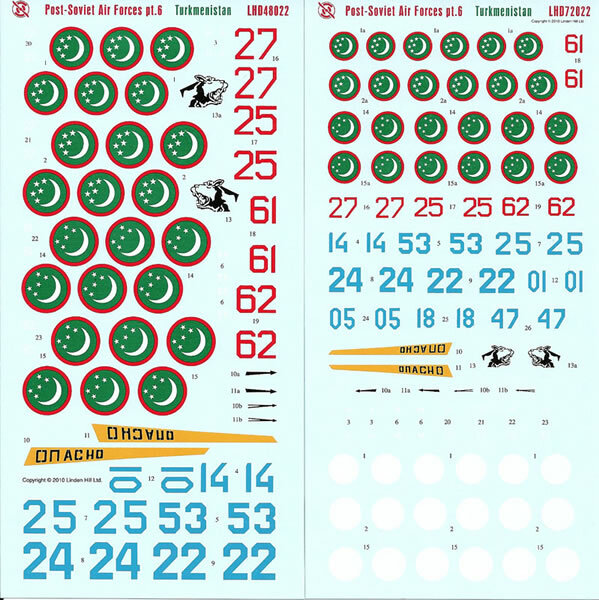 Linden Hill Decals has continued their recent Post Soviet Air Force series with part five. 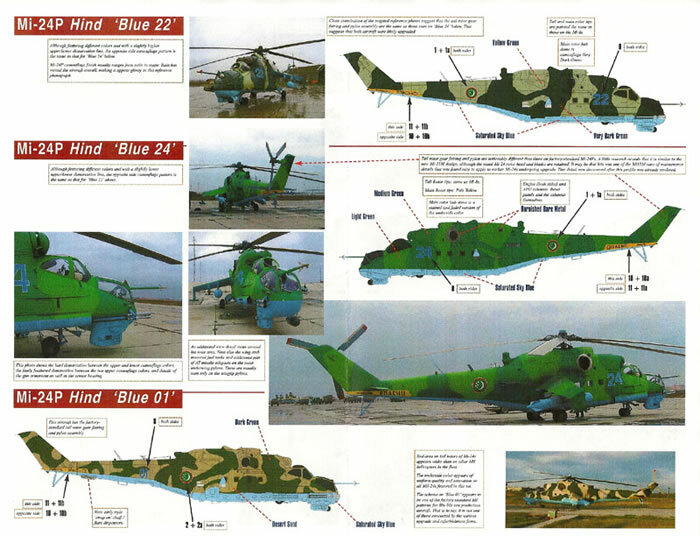 This time they have ventured into the Central Asian Republic of Turkmenistan and again provide markings for a range of aircraft types ranging from MiG-29 Fulcrums to Mi-8 Hips with a range of detours along the way. 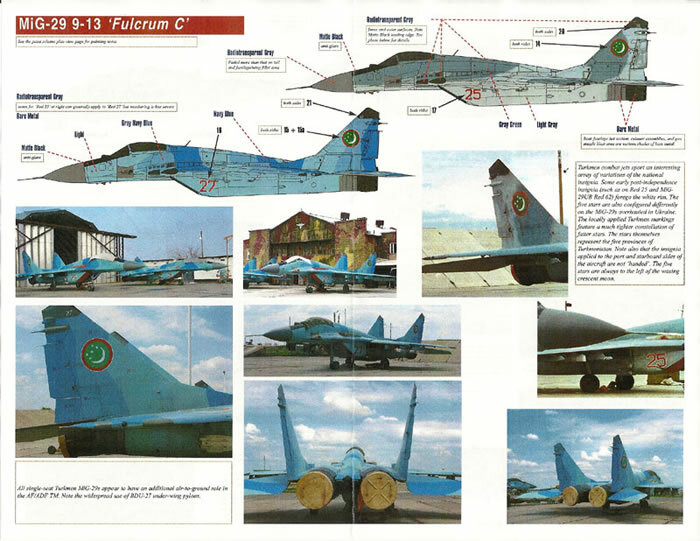 2 x MiG-29 Fulcrum C (model 9-13) – one in original camouflage and one post overhaul in a striking three tone blue scheme reminiscent of Russian carrier aircraft. 1x Su-25UB Frogboot in camouflage as above but not upgraded. As is usual with all Linden Hill sheets covering Russian, WARPAC and Soviet Era subjects all the schemes are well documented with the instructions including colour reference photographs and notes on the camouflage shades used and even weathering notes to achieve an accurate replica. 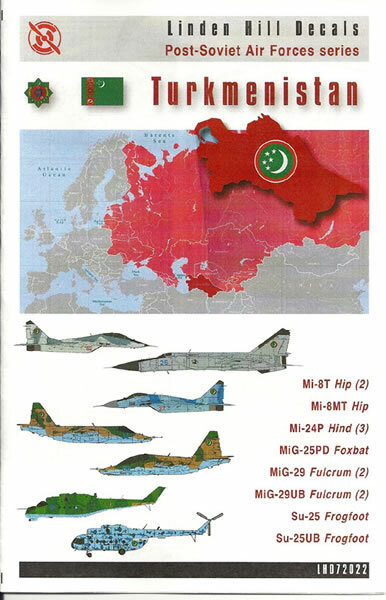 Given the scarcity of references related to Central Asian Republic and FSU air forces this is all very useful and welcome. The instructions themselves are spread over 8 A4 full colour pages and there is little more for the modeler to do but build a kit and apply this gorgeous markings. I have several of Linden Hills earlier sheets and have found the decals performed flawlessly without any special techniques required to get the best from them. This is a quality package which is up to Linden Hill’s usual standards. Thanks to Linden Hill Imports for the review sample.